As the traffic becomes more congested and technology improves, running a business from home is getting more popular and feasible. 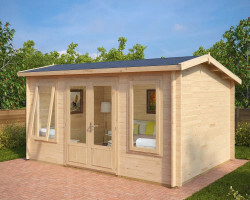 Happy, long mornings, no rental costs, more time for yourself and your family are just few good reasons to buy a stylish garden office shed from one of the best log cabin experts in the UK. Why not start working from garden home office? 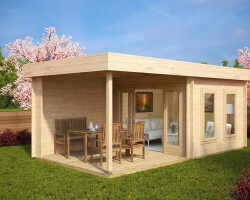 After all, by selecting your favorite log cabin model, your favorite colors and decoration, you are creating a very personal garden home office that brings a smile to your face and surprises your clients and business partners. Hansa Garden has nearly 100 DIY garden offices from which to choose. 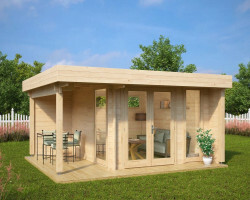 Building a garden office out of a Summerhouse24 DIY log cabin is fast, low cost and beneficial. 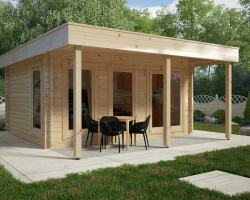 A small or a medium sized wooden garden office can be built and launched within few weeks time and within a £5000-6000 budget including our assembly services. 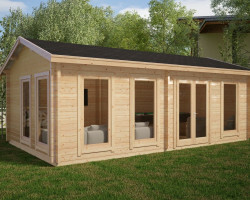 We are not talking about an inferior timber garden shed but a proper stylish wooden structure with sturdy 44-70mm walls, double glazing in windows and long life span. Our garden offices have a 5 year factory gurantee. 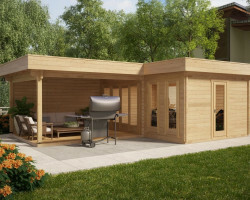 Building a garden office from scratch involves several stages from planning to launching and we are happy to share with you some of our experience to give you a better understanding about Summerhouse24 garden offices. 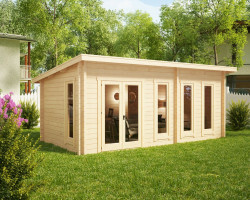 First of all, a log cabin gives you great flexibility in size and design of your garden office without taking the budget to the next level. For just a few extra hundreds of pounds you can acquire a significantly larger office building. 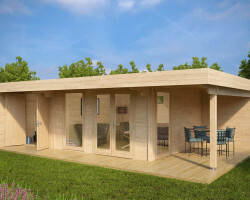 The design of a garden office hardly effects its price either. 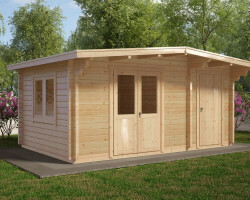 We have over 100 garden offices to choose from. 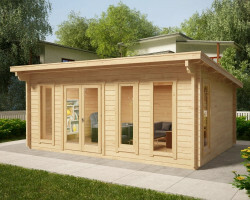 You can find almost any size you like from a small 8 m2 room up to large 50-60 m2 office buildings as well as many different styles from old classic looks to our favorite modern Hansa design garden offices. 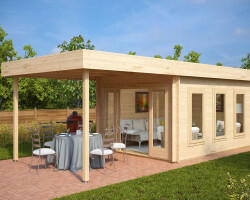 Many of our customers request changes to our standard garden offices or even have their own size and style in mind. 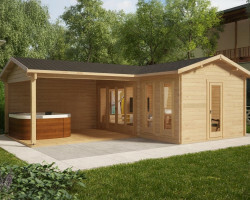 Summerhouse24 is not just a log cabin dealer, and since we have our own design team and production unit, we can work out and supply almost any type of bespoke garden office. 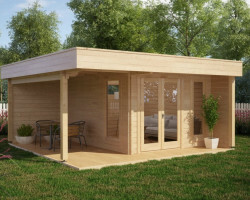 These tailor made garden offices have a 15-20% higher price tag and a little longer delivery time compared to similar standard cabins but your bespoke garden office corresponds exactly to your needs and requirements to run your business smoothly, with comfort and in style. 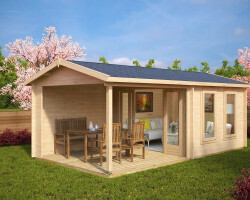 Our garden office kits are wrapped into weather proof packaging before leaving the factory and delivered to you in a truck with a “Piggy-Back” forklift so we can unload your log cabin as soon as it reaches your desired location. 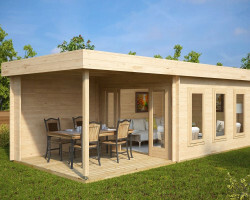 Standard garden office kit includes all prefabriacted wall logs, roof boards, floor boards, impreganted foundation planks, doors, windows, metal storm braces, strengthening metal rods, nails, screws, roofing felt, cabin plans, detailed assembly manual as well as all other necessary components to have your log cabin assembled. Two adults with previous experience need tools and 2-4 days to have a garden office installed or you can book our installation services and have your garden office built within a day or two. A proper all year round garden office requires insulation. Floor and roof are the most important areas to be insulated. Place mineral wool panels or other type of insulations under the floor boards and beneath the roof boards. Insulation materials are not a part of our standard garden office kit, but can be bought for a very reasonable price from your nearest building store. 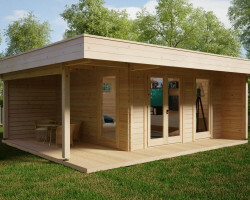 Before installation of a garden office can start you need a good proper base on the site. There are many suitable bases for garden office buildings, but Rapidpads base and concrete base are the most common ones among our UK customers. Concrete base is the most expensive and time consuming type of foundation to prepare, but it is stable, long lasting and probably the best possible base for a garden office and it suits well to any size and type of garden building. Rapidpads base on the other hand can be achieved for almost three times less budget compared to a concrete base. Since it is still very stable and a safe base for almost any type of garden office, Rapidpads are gaining huge popularity. The Summerhouse24 assembly team does the base, installation, insulation as well as certified electrical works. 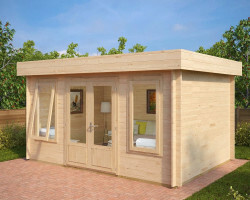 When your garden office has been built it is necessary to coat it with paints or wood preservatives. This protects its wooden components from mould/mildew, rotting, UV as well as from other external conditions and at least doubles up its life span. Well chosen paints and wood preservatives can make a huge impact on the overall appearance of your garden office. Hansa Garden has models for all tastes, needs, and budgets. A starting entrepreneur can build his first garden home office for slightly more than £2500-3000. 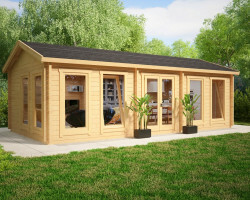 To find a small and affordable log cabin, click on Small Garden Offices and check out our smallest models. 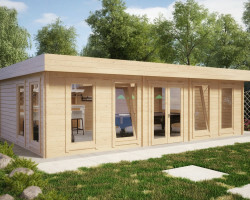 To open a beauty salon, a small bakery or a modern garden office for several people consider our Large Garden Offices from 8 m² and up to 15 m², 25 m² or even larger. 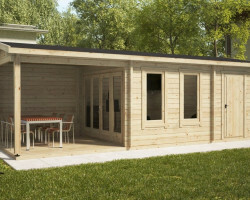 For our customers who prefer the newest technology, the newest everything and the most modern lifestyle, we have a selection of modern garden offices. Our newest design elements include big panorama windows and special details to give garden log cabins a very trendy and modern look. 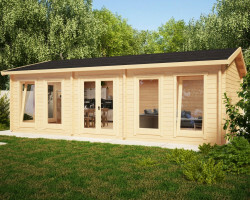 Check out our luxury garden cabins Hansa Lounge and Hansa Lounge XL. During those warm summer days, by being an owner of garden office with terrace you can make your business days even brighter. Morning coffee, lunch or meetings on the veranda are the things that your friends working in the business centers can only dream about. 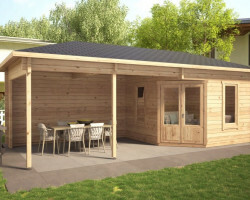 Have a look on our choice of garden office sheds with veranda or request a terrace added to any of our garden log cabins. If you are looking for something elegant, have a look on our octagonal and hexagonal summer houses that can also be used as a home office. 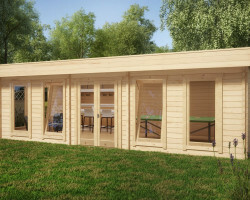 Basically, any of our log cabins make a perfect garden office. It is just a question of required space, style, and budget. 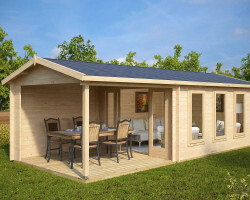 All our flat pack log cabins are 100% DIY garden offices for most of the people. Quick and easy way to build your own garden office for the lowest possible cost.